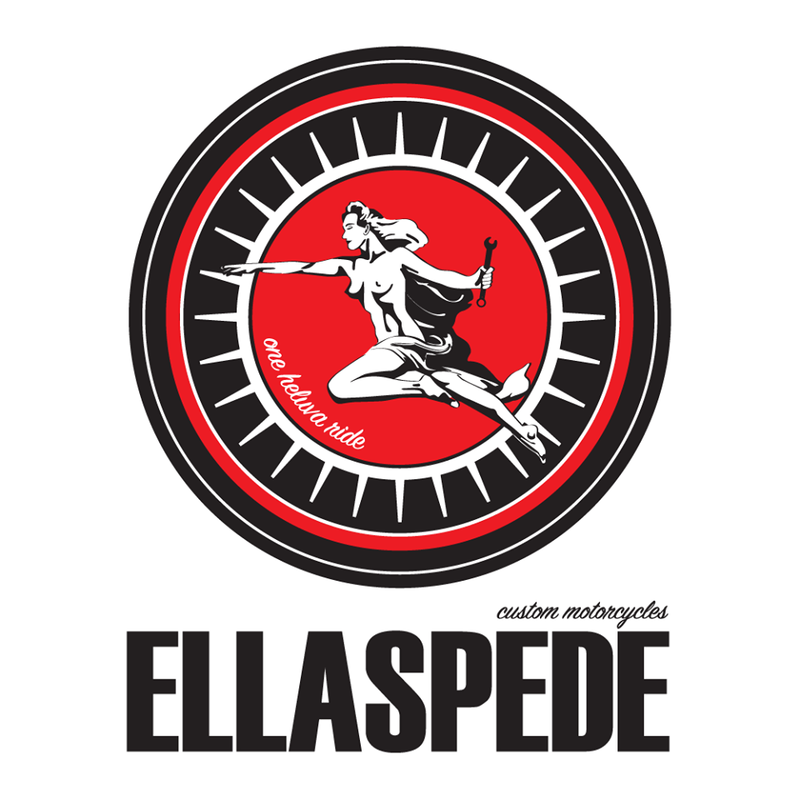 Ellaspede offers the complete range of services or fabrication for your custom, classic, cafe racer or stock motorcycle, new or old. Our team of fabricators, mechanics and auto electrician are on hand to complete everything from minor log book servicing to full ground up custom builds. 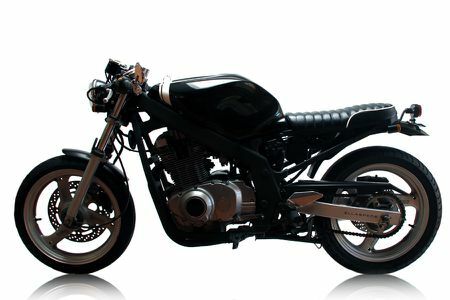 Our trade qualified technician, industrial design team, and experienced fabricators offer a wealth of experience in all types of motorcycle work, including bespoke component development and corporate bike building. We’re open 7.30am – 6.00pm Monday – Friday and 7.30am – 1.00pm Saturday. Our West End location makes it convenient for those living in the Brisbane CBD and inner suburbs. Can’t make it within these hours? No problem, we’re pretty flexible so talk to us about arranging an alternate time to drop off or pick up your bike. 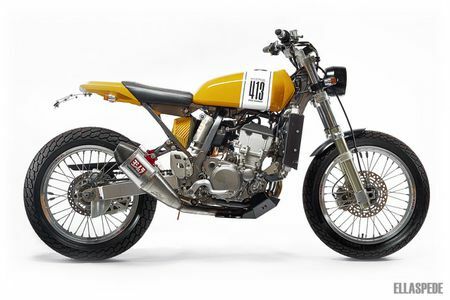 Ellaspede is a hub for motorcycle culture and creativity. Our team utilises traditional and modern automotive design techniques to create a range of hand crafted custom bikes and bespoke parts. We’re driven to challenge the norm whilst still providing the utmost attention to detail and innovation. 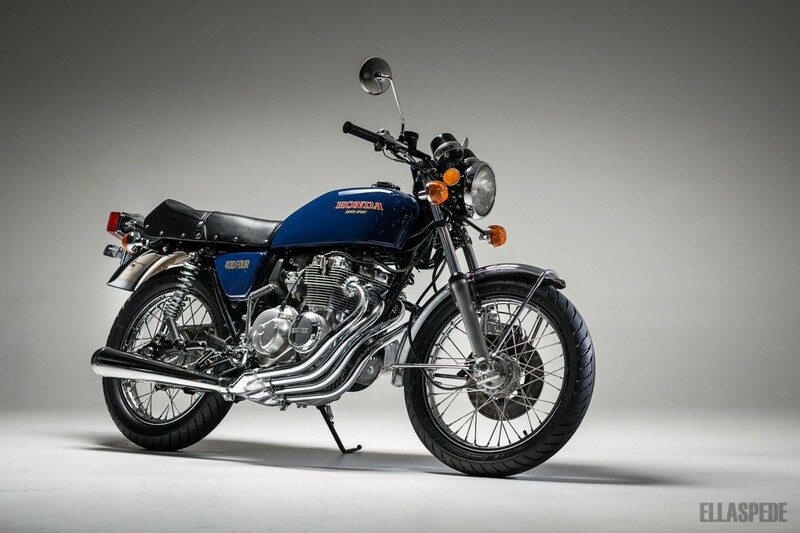 When you talk about old Honda road bikes, it doesn't tale long for the conversation to reach a story about a 400 four, enter Stephen's 1977 Honda CB400 Supersport. In his earlier years, Stephen was buying and selling Honda fours for part enjoyment and part profit. 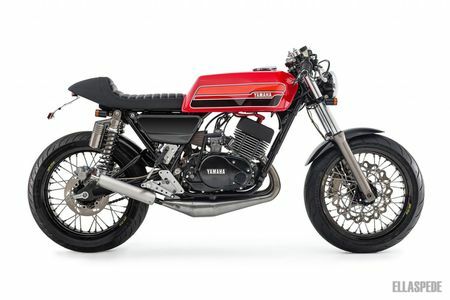 Why the CB400 Supersport over the uber popular bigger brother 750? He just through they had a great style and a smooth inline four that wasn't overpowered, plus every mechanic he'd ever spoken to seemed to love them. 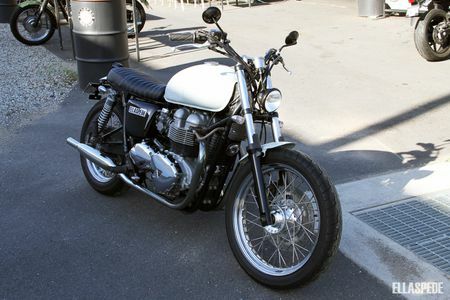 In 1995 while at university in Townsville, this particular CB400 popped up and was selected for a full restoration. One month later it was stripped and placed into milk crates, where as life would have it, the bike remained for the next 10 years. Fast-forward to 2005 in Sydney and the dream of those 4-into-1's at 10,000rpm had resurfaced. The bike was pulled out of storage and some parts sent off for re-chroming. But before the project regained momentum an overseas job presented itself and for the next 8 years the CB400 would again call storage home. Upon return in 2013 Stephen decided it was third time lucky. After seeing some Ellaspede bikes online he knew it was the place to realise the long-term goal of a sweetly restored Supersport. Having owned six 400 fours in his time, and still with quite a collection of parts, there was boxes of bits to sort through when the build finally began at Ellaspede. 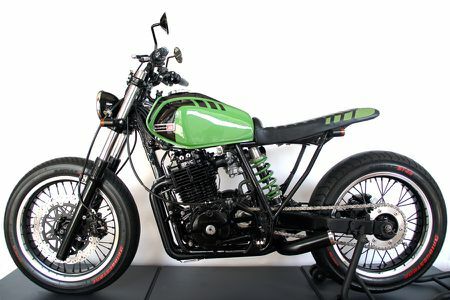 Having waited 20 years to put his dream bike together meant that Stephen knew exactly what he wanted, which was a thorough restoration with no corners cut, exactly how we wanted to approach the build. The best of the OEM parts were stripped or blasted before being painted, polished and powder coated back to original factory spec. Genuine Honda parts were sourced where possible. The engine received a full top and bottom end rebuild, with everything hydro-blasted and balanced before new gaskets, seals and bearings were installed. A 460cc kit now breathes through performance valve springs and a ported and polished head, ensuring the inline four still goes as well as Stephen remembers. The wiring loom is the achilles heel of most old bikes and was replaced with a brand new Honda item, connecting to a new points ignition with new plugs throughout. Stopping and handling was enhanced as much as a factory aesthetic restoration would allow. An emulator valve kit and new springs dropped into the rebuilt front forks, while brand new rear shocks keep things steady out back. New calipers and performance pads make the most of the now reasonably good standard brakes. Modern Avon Roadrider rubber enhances the factory setup. Overall the rest of the build came together once the tricky parts were sourced or otherwise refurbished. So 20 years, a number of other Honda fours and 3 attempts later Stephen now has the CB400 Supersport he'd dreamt of at university. Standing the test of time, he still believes it's the perfect combination of size, performance, sound and style. He mentioned that every motorcyclist who stops him on the Supersport has nostalgic feedback or a story about a 400 four, and it's not hard to see why after riding this bike. Stop Stephen around town now and he might tell you to restore an old single or twin if you're going down this path (so you don't have to buy 4 of everything for the motor! ), but we're betting that's not his advice when the 4-into-1's are singing at 10,000rpm in the hills around Brisbane. 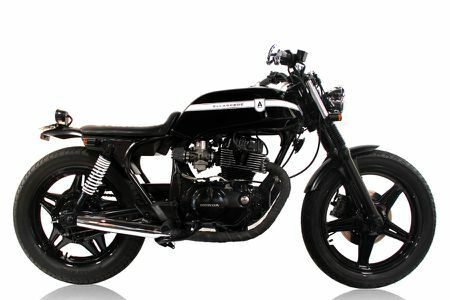 Now if we can just twist his arm to do a custom with the other 77' CB400 Supersport sitting in his garage (Yeah, he's got two.) then he'd have the perfect pair!